Hickory, NC Chief of Police Lentz is looking for assistance enforcing the work law. The law requires men 18 to 45 to be productively employed. The public is asked to identify loafers. Separately the Provost Marshall General Crowder has determined the work or fight order does include professional baseball players, whose profession is considered non-useful. 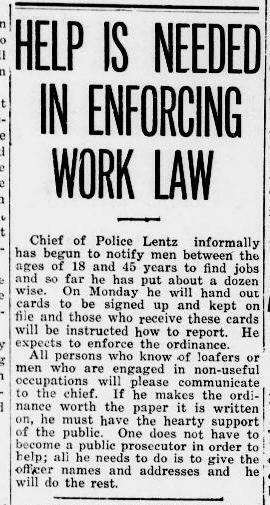 Source: "Help is Needed in Enforcing Work Law," Hickory Daily Record, Hickory, North Carolina, June 21, 1918. Page 1, Column 2.